A Salem man shows off wildlife and the beauty of the land from a hot air balloon. Jim Desch of Salem admits he is full of hot air and is pretty much clueless about one of the most important aspects of his vocation. It wasn't so long ago that he landed his hot air balloon in a field near Turner, and the farmer informed Desch he's stupid. "I couldn't disagree with him," said Desch, who with his wife, Shirley, operates Balloon Flying Service of Oregon. "Balloon pilots are stupid because they don't know where they're going, but I don't look at it as stupid. I look at it as adventure." Desch and three or four passengers have been having adventures somewhere over Salem on most mornings from May through October since 1989. It is obvious from the moment you shake his hand that Desch is in the right business. 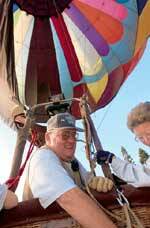 Jim Desch, owner of the Balloon Flying Service of Oregon, prepares for takeoff Wednesday. 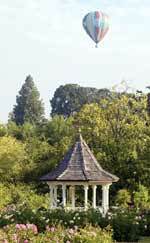 Desch's hot air balloon flies over Bush's Pasture Park. "Even my crew calls me Mr. Hot Air because, not only do I fly a lot, I talk a lot," he said. "That's me. You're talking to the right guy." Once in the air, Desch has a captive audience. "It's pretty cozy in there," he says, describing the 42-inch by 54-inch basket. "We hand out Tic-Tacs if we need to. It's fun. I meet neat people, and I can tell them anything I want to tell them because they're in my environment." Aside from the hot air - the 2,300-degree blast from the igniters and the constant flow from Desch - the flight is out of his hands. "I don't have a course," he said. "I actually do have a clue where we might be going, but whether or not I get there, that's a good question." It's hard to tell what you might see as Desch maneuvers the balloon from 300 feet to 1,000 feet on a recent calm morning, trying to find some wind to propel him in some direction, any direction. A beaver swims across a pond near Wallace Marine Park, herons and osprey patrol the Willamette River and a mallard with two ducklings swim away into the Reed Canary grass along a slough, hiding from the silent behemoth above them. Homeless campers in the tall timber poke their heads from makeshift shelters. "We see a lot of birds. There's a heron rookery in those trees along the river," Desch says. "There are a lot of osprey and we see eagles occasionally. We see coyotes out in the South Salem hills, and we stirred up two red foxes the other day out by Keizer. The only birds that get aggressive are the split-tailed swallows. Sometimes they'll dive and screech at you." On a recent trip, chinook salmon were visible in the river shallows, and sometimes passengers see western pond turtles. "There's a gal out in Keizer who has a hot tub that now has a roof over it," Desch said, chuckling. "Last year, I buzzed her twice, and the second time she had a big umbrella handy. It didn't have a roof, but this year it does." Whenever he can, Desch takes his balloon down to dip his customer's feet in the Willamette or in a pond. "It's part of the schtick," said Desch, who also provides a post-ride toast, a continental breakfast, a history of the sport that's been around since 1783 and a certificate of ascension. "It's fun for the passengers, part of the show, and I can tell by the body language if they don't want to do it," he said. "It's nice to go down and fly between the tree lines, see the birds and sometimes Bambi comes out and waters." Desch confesses to being afraid of heights, but the only time he's fearful in a balloon is when he has a new one and he takes it up to 10,000 feet to stretch out the seams. "When I can see the curvature of the Earth over the coast, I stand right in the middle of the basket," he said. Most of his flying is from 500 to 1,500 feet, though he'll take passengers 3,000 to 5,000 feet if that's what's necessary to find favorable air flow. "We've had two occasions where the body language has told me this person is not ready for this," Desch said. "We stop right then, drop a line and let them out." How secure the basket feels depends on perspective. "It's waist high on most people," Desch said. "If you're short like me, it's tall. If you're tall like you, it's short." Taller passengers, particularly balding ones, also will notice the heat from Desch's giant blowtorch. A hat provides adequate insulation. More than half his customers have been given a ride as a celebration of something special: a birthday, anniversary, graduation, retirement, Mother's Day, Father's Day and so on. On a flight this week, in addition to a newspaper reporter, the balloon toted Frances Callahan of Lebanon, who was celebrating her 86th birthday; Diane Gay of Jefferson, who recently turned 50; and Jim Hahn of Junction City, who was collecting on a Christmas present. "It's something I've been wanting to do for a long time," Callahan said. "It was really exciting. The worst part was getting in that balloon. I rode an elephant at Wildlife Safari a couple years ago, and it was a real struggle to get on that elephant, and this felt like the same thing." Hahn, a helicopter mechanic in Vietnam, has piloted small airplanes and had the goal of adding to his list a ride in a hot air balloon, a glider and a blimp. "I can't imagine going around the world or across the Atlantic in one of these," he said. 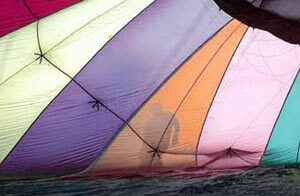 The balloon is 66 feet across and measures 77 feet from the bottom of the basket to the top of the balloon. Desch plans to fly for an hour but carries enough fuel to take him well beyond, and when the weight of the equipment is subtracted, he can carry about 1,100 pounds in cargo. He once flew himself and a family of seven very skinny people. It's not unusual, when the balloon takes to hovering more than gliding, for Desch to pull out a bag of popcorn and sprinkle a few kernels over the rail. He watches intently for a bend in their drop, a clue that he can descend to a level of air that is on the move. "A lot of pilots spit," he said, but my wife doesn't like me doing that. "So she gives me popcorn." He says it's impossible to get airsick in a balloon. "There is absolutely no motion, no movement, to a balloon at all," Desch said. "It doesn't sway, swing or bounce up and down. I've never had anyone mention being sick. It's like sitting in a chair. If you get airsick sitting in a chair, then don't call me because I can't use you." He has a lot of stories to tell about passengers. There's the 85-year-old retired nun who wore the traditional habit and was adamant that nobody would see her ankles as she got in and out of the basket. And there was the 90-year-old who chartered a takeoff from Meadowland Golf Course and asked whether he could bring along some of his girlfriends. He showed up on the morning of the flight with three ladies. One of his specialties is a flight he advertises as romantic, usually a proposal of marriage. So far, no prospective brides have said no. He even does in-flight weddings. "I'm an ordained minister," Desch said, grinning mischievously. "It's a mail-order ordination from a group that also can show you how to set up a church as a tax-free corporation, but it's legal." He's done 15 weddings, 12 of them in the air, and to his knowledge, none of the couples have divorced. His own first ride came as an anniversary present to Shirley. He was having so much fun, the pilot told Desch that his next ride was going to cost him $10,000. "By the time I got my training and bought my first balloon, it cost me $9,600 and change," Desch said. "So he was close." Soon after that, Shirley decided if they were going to make that kind of investment, they'd better let somebody else pay for it. They started their business 12 years ago and now have 1,300 hours flying over Salem. He thought he'd be afraid on that first flight. "Your brain goes through a comparative process, and with a balloon, there's nothing to compare it to," Desch said. "It's not an elevator, not an escalator, not a helicopter, not a circus ride. It's totally different, so your brain has to start a new file." The new file did not include strife. The hairiest part of any flight is landing and obtaining permission to land. Desch and his chase crew work together to make the landing and the connection with the property owner smooth. He's been denied permission twice. One was the farmer who called him stupid. "The other time, it was a pot farmer. I'd landed in a 12-acre patch near Canby, and our crew asked permission from a biker guy sitting on the front porch of his mobile home, and he said no, to get out of there," Desch said. "As we were taking off over the Molalla River, we saw that green patch down there. I called my policeman friend because the guy was such a jerk, and he got busted." Despite pot fields and hot tubs and occasionally flying over an abandoned stolen car, he has never been shot down, never had an accident. "You don't get to be this age by being stupid," said Desch, 61. "I keep it pretty conservative. You get windy landings, that sort of thing, but I get very few of them because I just don't fly in those situations. "We pride ourselves in giving the customer a really smooth ride, a smooth landing, because this aircraft doesn't have any brakes, wheels or shock absorbers." Roy Gault can be reached at (503) 399-6723. Bill Pallnow, a crew member from the Balloon Flying Service of Oregon, walks around the hot air balloon as it is being inflated for departure.